As expected, the sales were slow between November 1 2013 through March 31 2014 in the 6 beachfront high rise condos on the MS Gulf Coast. I have no doubt that the extremely long winter season played a big role in the slow sales. Foreclosures continued to play a factor in pricing by dragging down the average sold price. Cash continued to dominate the condo transactions with 75% of the sales be cash purchases. We are looking forward to a strong selling season thru August. Sellers are raising their prices as inventory tightens. With only 58 total condo units currently on the condo market, it should now be a sellers market. In 2013, there were 69 total sales in the first ten months of the year. At this time, there are no foreclosures left in the condo market. The MS Gulf Coast beachfront condo market is still very attractive to the value conscience buyers with prices from 35% to 46% under the top of the market in 2007. As prices continue to increase, the availability of financing will be essential to the continued growth of the beachfront condo market. The good news is that there are lenders willing to finance condos using conventional terms of fixed rate 30 year loans instead of 5 year balloon mortgages that dominated the unstable market of the past. You’ll find the contact information for Chris Brumfield, of Supreme Lending, in this newsletter. Supreme Lending specializes in financing condos, and Chris knows this market. Give him a call if you need information or financing. My next update will be at the end of the 2nd Quarter. Until then, please let me know if I can help you in any way. 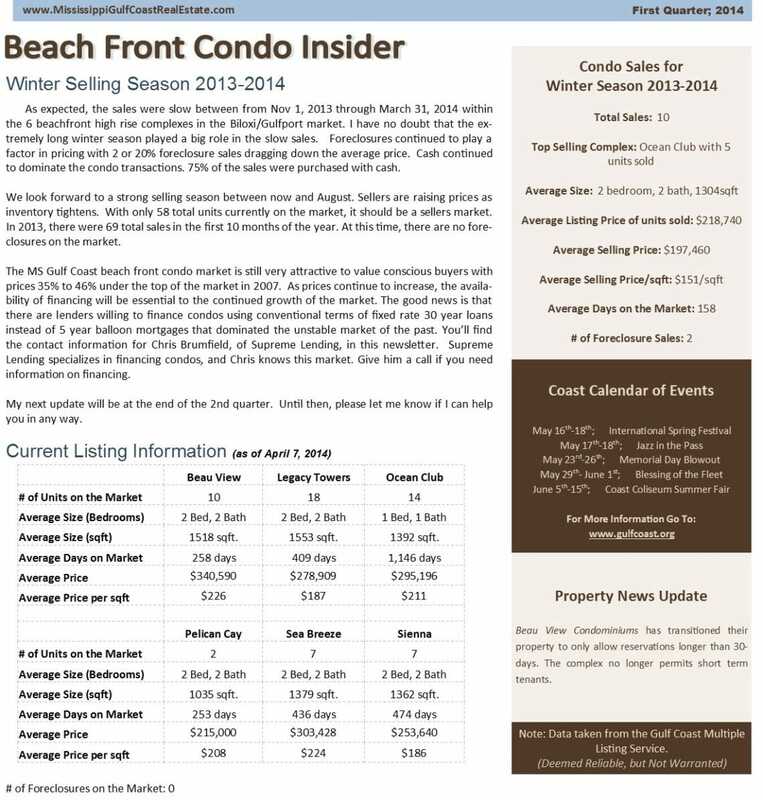 Please email me if you would like an electronic version of the Condo Insider Report First Quarter 2014. Average Size(sq. ft.) 1518 sq. ft. 1553 sq. ft. 1392 sq. ft.
Average Size(sq. ft.) 1035 sq. ft. 1379 sq. ft. 1362 sq. ft. Detailed information from a Broker’s perspective on the activity of the beachfront condo market in Biloxi/Gulfport, Mississippi for the First Quarter of 2014.